Welcome by my blog today, everyone! 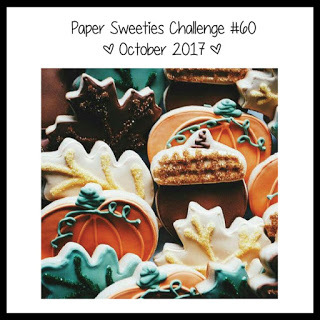 It's the first of the month, and time for another FUN and FABULOUS Photo Inspiration Challenge at Paper Sweeties. For the month of October, we have a GORGEOUS photo to inspire your creativity. Now, we know that each of you will be creating some Autumn cards and projects this month.....so why not share them with us this month at Paper Sweeties? We absolutely LOVE seeing your creativity, and YOU could be the lucky winner of a $25 gift certificate and have the opportunity to Guest Design for us. Look at this lovely inspiration photo! When I saw the photo, I knew right away that I wanted to do. However, I don't yet own any of the Paper Sweeties sets with pumpkins in them (such as Autumn Blessings, Give Thanks, Happy Thanksgiving, Etc.) but......I do own the sweet Happy Fall Ya'll Stamp Set. I knew that I had to get super creative on this one, so I started with the Scalloped Oval Frame Sweet Cuts and used them to cut the ovals to create my pumpkins. 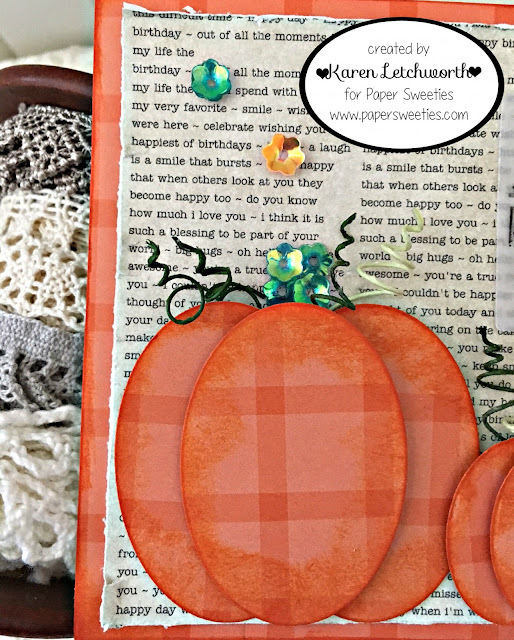 I discarded the cute scalloped edges, and simply inked the ovals and layered them with 3-D tape to create these adorable pumpkins. I inked them and added some tops and swirls to make them look real. Next, I added my sentiment which is from the Happy Fall Ya'll Stamp Set. I stamped it onto a tag that I cut from vellum using a tag from the Stitched Tags #1 Sweet Cuts. I embellished my card just a bit by tying two bows...one with Creamsicle Seam Binding and one with Frosting Seam Binding, and wrapping them with a piece of jute. The stems of my pumpkins were created using Green Apple Sequins and I added a few extra accents with Creamsicle Sequins. Here's the list of all my talented Paper Sweeties team-mates who have created something to inspire you to play along in our challenge. Be sure to stop by each blog to see their sweet creations. There are so many DARLING products in the Paper Sweeties Shop, and these ladies' projects will inspire you and show you oodles of great ways to use these sweet products. We look forward to seeing what YOU will create! 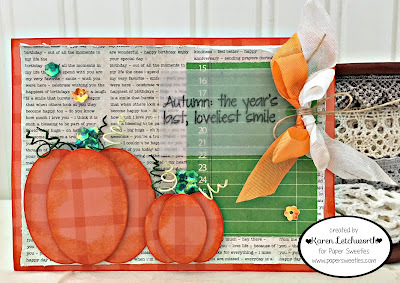 Simon Says Stamp - Wednesday Challenge Blog/Simon Says....."Anything Goes"
Karen, your card is gorgeous. Love that 3D pumpkin. LOVING those pumpkins!! This is FABULOUS!!!!!!!!!!!! Love those pretty pumpkins and the text background, Karen!! Very creative with the wire for the leaves and gorgeous bow, too!! Great card!!! Love those beautiful pumpkins! Lovely autumnal card and such clever idea making the pumpkins with the oval! Thanks for sharing! Simply lovely Karen - great job! So yummy ... love the pumpkin stems made from sequins!! 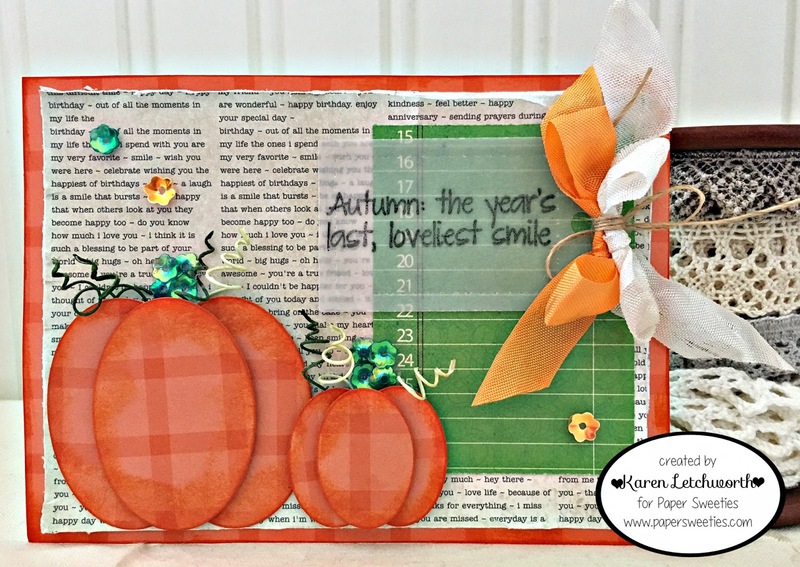 Always enjoy seeing text mixed into a card design, Karen, and I love your plaid pumpkins! Thanks for playing along with us at the Simon Says Stamp Wednesday challenge! This card is GORGEOUS Karen! I love the dimensional pumpkins and all that pretty bling! Creative on how you did those beautiful pumpkins Karen - fabulous work! Love it!